You need to record the sale of shares held in an investment account in Quicken 2012. Selling mutual fund shares works basically the same way as buying them — only in reverse. Display the investment window by clicking the Investing Center button and then clicking the Enter Transactions button. Quicken displays the dialog box used to enter investment transactions. Select Sell – Shares Sold in the Enter Transaction drop-down list box. 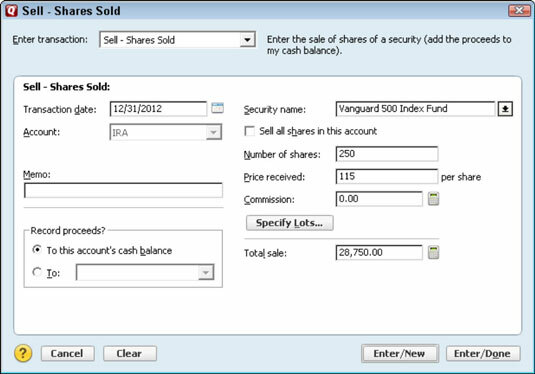 Quicken displays the Sell – Shares Sold version of the investment transaction entry dialog box. Enter the sale’s date in the Transaction Date text box. (Optional) Type a brief description of the sale in the Memo text box. If you’re selling all your shares, click in the Sell All Shares In This Account check box. Give Quicken the number of shares you’re selling. Use the Number Of Shares box to specify the number of shares you’re selling (if you didn’t click in the Sell All Shares check box in Step 5). Indicate the price per share that you received by using the Price Received text box. With a little luck, your selling price is more than you paid. Enter the commission or fee you paid to sell the shares in the Commission text box. No wonder Bernie, your broker, does so well, huh? He makes money even if you don’t. Quicken calculates whatever you don’t enter. For example, if you tell Quicken how many dollars you sell (by using the Price Received text box), it calculates the number of shares you sell by dividing the total sales amount by the price per share. If you tell Quicken how many shares you sell (using the Number Of Shares text box), it calculates the total sales amount by multiplying the number of shares by the price per share. Enter the bank account into which you’re going to deposit the sale’s proceeds. Click one of the Enter buttons.